Peeps of Hyderabad, are you interested in doing something sedate this weekend? Then ditch your party plans and visit the art galleries and museums in town. Whether you’re looking for contemporary art or want to unwind at a cafe inside a gallery, here’s LBB’s list of the best where you can go, gawk at some art, and get home, inspired. Shrishti Art Gallery was set up in 2002 by Remani Nambiar, an Ikebana practitioner and Ikebana teacher. With the desire to bring to light the works of contemporary artists, this art gallery fosters art exhibitions, art camps, and workshops on a regular basis. Here, you can get a scoop of art through abstract, realistic, still life paintings, but we say — if you are an art enthusiast or a learner, sign up for their art camps/workshops. Located in Kavuri Hills, State Gallery of Fine Art (SGFA) is one of the best galleries for you to spot local art. 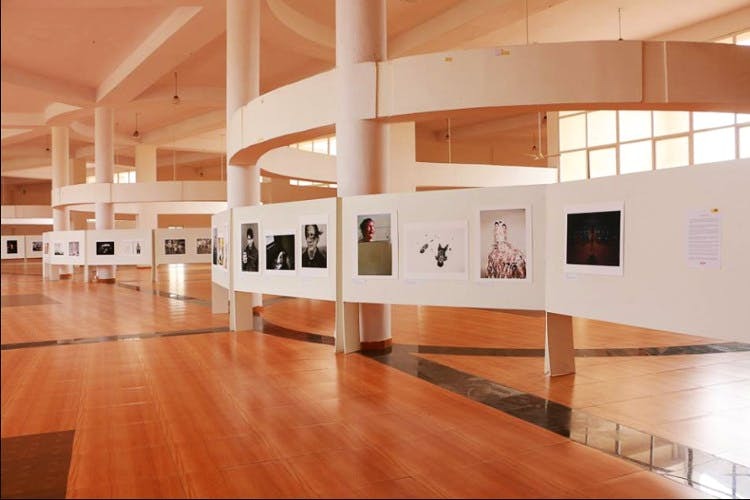 Popular for photo and art exhibitions, this modern gallery is where you can discover upcoming artists and cool photographers. Always bustling with activities and workshops, we are sure you can spend an entire day admiring the art here. Plus, its in-house cafe — Deja Brew — is a melting pot of culture, art, and fun. It hosts some epic music concerts, movie screenings, workshops etc. Plus, it has a co-working space where you can get to devour chai, samosa, and Osmania biscuits too. Located on road no. 12, Banjara Hills, ICONART should top your list of art galleries. Known to promote emerging artists and painters, this gallery also has an Artists Residency facility. There is never a less busy day at this gallery as it is always hosting workshops, exhibitions etc. They also have an in-house curator and critic and they take up art consultation as well. You already know Gallery Cafe, and if you’ve already visited it, the chances of checking out the Kalakriti Art Gallery are high. Popular for promoting creativity in visual arts, this art gallery houses contemporary art, and the work of more than 50 artists. We love attending the exhibitions at Kalakriti, which leave us all inspired and take us back for more. It also has a residency program for upcoming artists. So, if you are one, be sure to check out their website. Located in Banjara Hills, Gallery Space is a quaint art gallery where you can go, praise some art. In the mood to check out more than just contemporary art? Then you can gawk at the graphic prints and sculptures, drawings etc. It also curates the work of some of the best local artists and organises exhibitions. So whether you are an art buff or a beginner trying to understand the approach of art, you must absolutely visit Gallery Space.